The Thai Spa is Eastern India’s first ever spa chain to promote and practice authentic Thai massage therapy to cure various ailments. Thai massage dates back to 2500 years in the time of Lord Buddha. Shivago Komarpaj, believed to be a physician to Lord Buddha, is the founder of this massage technique which is performed along the body’s energy lines. Afterwards, this technique has gained worldwide popularity under the name of ‘Traditional Thai Massage’. 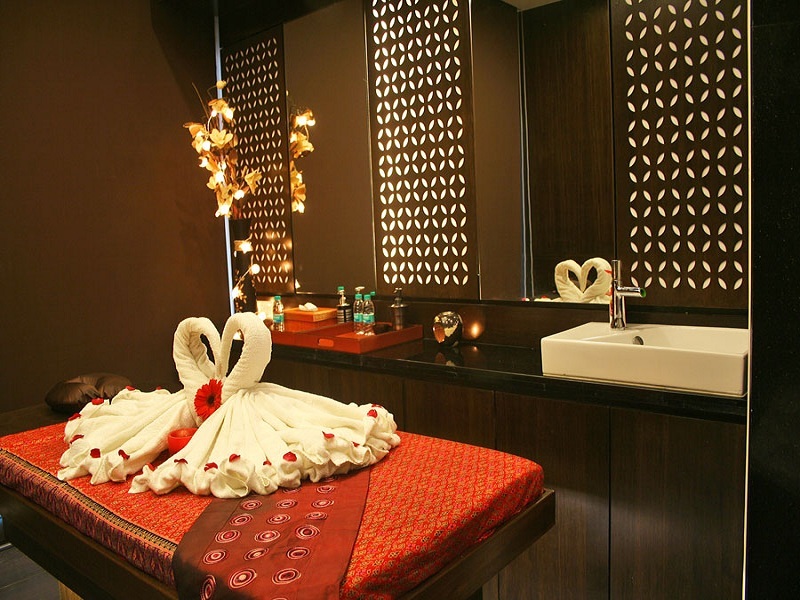 ‘The Thai Spa’ has played the role of a stalwart to bring the rich legacy of Thailand’s spa culture to India. With their authentic therapy procedure, the brand has retained the original flavours of Thailand in each and every outlet of ‘The Thai Spa’ in India. The leading spa chain is aimed to keep the promise of authenticity intact by appointing highly-skilled native therapists from Thailand. The use of imported essential oils and aromatic herbs has also contributed a lot in maintaining the authenticity. ‘The Thai Spa’ started its journey from Eastern India with its first-ever outlet in South City Mall in Kolkata. The outlet gained a lot of popularity and experienced hundreds of footfalls in no time which encouraged the brand to launch eight more outlets in the city of Kolkata. With gradual expansion, the spa chain started to bloom all across the country with outlets in the cities of Ahmedabad, Amritsar, Bangalore, Bhopal, Guwahati, Mumbai, Pune, Raipur, Siliguri and Surat. With a motto to provide an experience of sheer tranquillity to a larger number of people, the brand is aiming to launch more outlets in the various states of India. With dedicated and keenly supervised customer service, ‘The Thai Spa’ is emerging as the best name in the spa and wellness industry in India. All the outlets of ‘The Thai Spa’ maintain the same degree of adherence to superior practice of hygiene, customer service and authenticity. Some of the most popular services of ‘The Thai Spa’ are Hot Stone Massage, Candle Massage, Balinese Massage, Sports Massage etc to name a few. Each of these is performed with utmost care and is sometimes aided with aromatherapy candles and herb extracts to cure fatigue, stress, strain and mental turmoil that come with a hectic lifestyle. To capture the truest essence of Thailand’s rich legacy of spa culture that soothes one’s soul with unadulterated rejuvenation, a visit to any outlet of ‘The Thai Spa’ is a must. Royal Thai Massage is an ancient and traditional therapy based amalgamation of Ayurveda, Yoga and Buddhist mysticism that enables your body to get rid of the toxins and boosts the immune system. This massage has been in practice since the time of Lord Buddha and has a tremendous impact in the overall well-being of the body, mind and the soul of the recipient. What benefits does this massage have? How Royal Thai Massage is performed on the body? Royal Thai massage follows the ancient techniques of Thai massage therapists. The massage is performed followed by the designated ‘Sen’ lines of the body. These lines carry the body’s energy in them. The massage is performed using deep tissue compression, kneading and tugging of the muscles, stretching and rhythmic pulling of the body aided by supporting yoga postures. Royal Thai Massage is the most relaxing and rejuvenating of the ancient spa therapies of Thailand. It has derived its name from its ancient recipients who used to be the royals and aristocrats of the society. The massage had codified procedure to treat the ailments of the royalties. If you are looking for a signature body spa therapy that has a long-lasting effect on the supreme wellness of your body, Royal Thai massage is the best choice for you. Book an appointment in a traditional spa of repute that offers authentic Thai massages and enliven your senses by a royal massage. The winter season is here and it has already started to blow chilly winds that rob your skin off its natural hydration. The lack of moisture in the air results in flaky, dry skin with visible signs of ageing. To revive a glossy glow on your skin and to revitalize your mood freshness in the decaying season, it is pivotal to take up a few sittings in the spa. A spa massage will not only soothe your soul by providing utmost relaxation, but also will make your skin supple with re-newed vigor. Though you can opt for any massage that you have a preference for, we are enlisting two types of body massages that are the best for you in the wintry season. Hot Stone Therapy - Hot Stone therapy is highly effective for muscle relaxation, improving blood circulation and replenishment of the energy level of the body. Volcanic stones, usually made of Basalt, are sanitized and pre-heated before the therapy. The therapist will massage you first with aromatic oils to warm up your body and later, will massage you with the stones. The heated stones can also be placed on typical points of your body, like along the spine, on the palms etc to improve the flow of energy through your body. Keep in mind - Hot Stone therapy should only be performed by an expert therapist who has deep knowledge of the process. Also, you should prefer a reputed spa chain that cares a lot for sanitization. Do not avail this service in a budget spa. Candle massage - Candle massage restores the balance among the four basic elements of your body- wind, fire, earth and water. Scented aromatherapy candles are used for the massage and are made of all natural, non-hazardous materials. 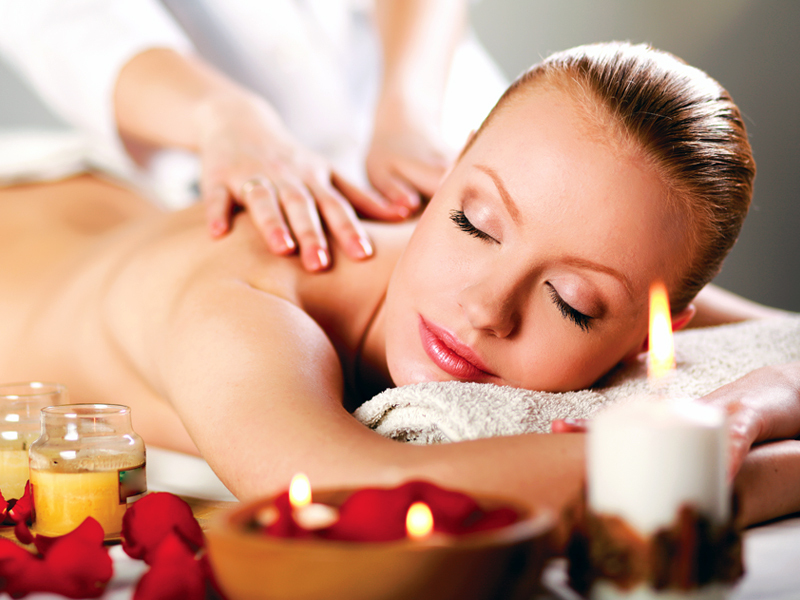 Candle massage is a supremely luxurious massage that uplifts an individual’s physical, mental and spiritual well-being. The benefits of candle massage include ease of tension and stiffness, improved blood circulation, relaxation and providing your body comfortable warmth. Add to it, the benefits of aromatherapy. Keep in mind - Since the process contains application of molten candle wax, you should only opt for a trusted spa chain that has skilled therapists otherwise you might experience burn. Also, you should only choose completely organic massage candles for the therapy. For an enhanced feeling of well-being, these therapies are a must for an individual. Apart from these two, you can also opt for conventional therapies to stay healthy and happy in this season. Happy winter to you! A massage therapy can miraculously treat many ailments. Some of these include insomnia, stress, weight control, back pain, headaches and so on. However, there are some specific massage techniques that are specially applied just for relaxation. Clear your mind if you just want to unwind or whether you are looking for ailment-specific treatments and tell your therapist clearly about it. Also, communicate with your therapist regarding the degree of pressure applied by him/her. Ideally, the therapist should provide consultation regarding the treatment that you should undergo based on your condition and requirements. However, you can also choose a specific service that you have a preference for. Now the process, which again differs from therapy to therapy. However, in a top scale spa, the therapy room will ideally comprise of soothing and aromatic candle lights, fresh flowers, mild lighting and can also be accompanied with subtle instrumental music. While in the session, you need to adhere to a few spa etiquettes. Since the basic idea behind every therapy is relaxation, you need to focus on your body rather than distractions like a mobile phone or tablet. Also, maintain punctuality and be in the salon a little before than the scheduled time so that you do not rush in to the process. When it is your first time, be sure to tell the attendant about your preferences while booking your slot. This may include your choice of therapist, whether the therapist should be a male or a female. Also, if you have a reference, tell that right away at the time of booking. If you are availing a combination of services at the spa, choose the order accordingly. For example, if you have chosen to get both body and face massage, opt for the body massage to be done at first. Most of all, visiting a spa is all about wellness and rejuvenation. So, on the first even spa venture, go without anxiety or last minute hesitations. It is going to be a different experience than a normal facial, and you are going to enjoy every bit of it. We all commit trivial mistakes on new expeditions which is absolutely normal. So, keep away your inhibitions and take the full plunge into the world of blissful experience of a body spa. Massage therapy is the most common and effective therapy that people prefer for so many reasons. Massage does not just offer you varied health benefits, but also takes away all sorts of your emotional and physical stress and, offering you fresh being. Alongside, there are also sports massage therapies that can be taken, before, after or during any sports activity to stabilise and support your body in a way which is very comforting and safe. Ever since long time back, body massage is widely undertaken for its innumerable body benefits. This boosts your energy level and also helps you to undertake the daily course of activities at better pace. Better blood flow and circulation: Since kneading activity helps relaxation, this results in better blood circulation in your body. Helping you to get rid of so much body pain and different tensions, it also makes oxygen flow good and continuously active in your body. Getting rid of physical and emotional stress and anxiety: Even for the pregnant women, there are the best techniques of massage that helps them to overcome anxiety, making them feel comfortable. You need the touch and services of professional massagers who know the various body points to comfort and offer you the best massage, to replenish the senses in you. Health and skin tone benefits: With the use of effective herbal oils in the massaging, you get better body treatment which automatically reflects through your happy skin tone and lively mood. Also, the body massage is centred to help you get rid of body pain, making your muscles responsive and better muscular. Beneficial for sports activities: This has been a very lavish trend and the sportspersons have been taking up sports massage fir so many reasons. This not just helps them to strengthen their body for undertaking games, but also revitalises their body parts for quick action. This massage is not taken for soothing effects, but to prepare and stand your body for the best sports activities. You can easily get over the joint pain and notice better activities in your body which are very supportive for different sports. However, the conclusion of this all, is the reliable services of professional massagers. For the best services, you must visit the expert massage parlour in Kolkata, which can effectively help you get the best kneading movements and advantages. To make a comprehensive list, a spa therapy, irrespective of its kind, will surely help you to de-stress, detoxify and eventually bring you mental peace followed by unadulterated rejuvenation. A spa session will help you to cure muscular tensions and body-aches that develop over your daily schedule. If you have a desk-bound job, you will surely experience tension and uneasiness spreading over your neck and shoulders. Attending regular spa sessions will help you to get over this. Most of the massages parlous offer you a calm and soothing environment at the massage room. You will be treated with scented candles, aromatic oils and sometimes soothing music. The peaceful environment with the healing properties of aromatic oils will distress your mind from anxiety and tension. Prolonged exposure to pollutants, anxiety, stress etc not only affects your mind, but also will result in prolonged tiredness, fatigue and low-immunity. Specialized therapy by the expert hand of the masseurs at the best massage parlour will reduce the amount of toxins in your body. You know what real beauty is? Yes, it is what glows from within. Be prepared to embrace your revived skin and glowing face which will make you fall in love with yourself all the more after a few regular visits to the spa. It is imperative that when your body and mind is at peace, it will reflect in your face. A spa is the place where you can confide in to the luxury of the much needed ‘me’ time. However time or money you may want to involve for this, a spa is a ritual which will make your day. Once you make a habit of it, you will certainly look forward to the day of your session. So, think no more and book an appointment at the spa of your choice to unwind at peace. Hot Stone Therapy - Pre-heated volcanic stones with a deep massage can soothe your nerves and provide warmth and comfort to your tired muscles. This therapy is perfect for the treatment of arthritis, circulatory problems and insomnia. Balinese Massage - a rich and unique combination of aromatherapy, reflexology, gentle stretches and acupressure, Balinese massage enhances the oxygen flow in your blood, leaving you calm, relieved and positive. Foot Massage - Probably the most important and the most ignored part of the body, your feet deserves much more care. Since it carries all the weight, you need to indulge in a foot massage session for detoxification and relaxation of the tired feet. Four Hand Massage - Two therapists perform and mirror each other’s strokes in this uber-relaxing therapy. It is a Swedish massage specially performed for stress related issues. Thai Body Massage - If you do not want any products to be used on your body, this is the best pick. It is an authentic Thai massage that involves special strokes to infuse blood flow and to get rid of pain, stiffness and discomfort. Candle Massage - With the unique healing therapy of aromatic candles and essential oils, this massage soothes your senses and gives you a tingling freshness throughout. You may avail these services in any authentic massage parlor of repute. You can consult with an expert to know what massage you would need according to your concern and symptoms. Whatever treatment you choose, always look for proper practice of hygiene in the spa. Book your slot and let the masseur take care of the massage. You may guide him/her on the intensity of the strokes. With that, you are ready to brim with the refreshing glow of health from within. Your feet are perhaps the most stressed out part of your body. Every day, from the moment we wake up till the time we get back to bed, our feet are always active taking us through miles or maintaining our posture, be it household work, commuting to office or going shopping! For women, the situation is worse as their feet also endure the wrath of pointed heels or heavy stylish shoes. Therefore, it is of utmost importance that we take great care of our feet. Aroma Therapy is a traditional type of treatment that involves the use of aromatic extracts of plants and essential oils to heal ailments. This combined with the benefits of spa can give your feet the pampering it needs. Aroma Foot Spa includes healing techniques like massage that not only give you relief from sore feet but also soothe your entire being. In totality, it is a wholesome treatment that relaxes and de-stresses you at the end of a busy week! Aroma Foot Spa should not be confused with a beauty treatment! The massage which is an integral part of the process increases blood circulation which brings down the stress level of the body by putting crucial muscles at ease. Moreover, the right type of foot bath has a detoxification effect on your body by eliminating heavy metals and other kinds of toxins. So, if done regularly, the treatment will have a healing effect on your entire system. Those suffering from arthritis or insomnia or acidity can opt for aroma foot spa if they are looking for a natural cure. Like adding seaweed to the footbath reduces arthritic pain, going for a foot spa towards the evening will give you a good night’s sleep as it relaxes your body and relieves mental pressure. A proper footbath also reduces indigestion and heartburn. Massaging the feet with lemongrass essential oil leads to improvement of the lymphatic system. Done regularly it leads to increase in immunity. Aroma Foot Spa includes various types of treatments in its domain. If you choose an elemental massage, the technique will involve using the element that is most reactive in you. This type of massage promotes emotional well-being and has a positive effect on the overall health of an individual. Using a ball made up of dried Thai herbs wrapped in cotton to massage your foot exfoliates the skin and withdraws toxins. Soaks using river rocks provide the best massaging experience and thus reduce maximum stress. So get ready to satiate your nerves and caress your senses with Aroma Foot Spa- Muscle Relaxation techniques. It is an investment that gradually infuses good health and positivity into your lifestyle. Also known as Essential Oil therapy, the definition of Aromatherapy is the science and art of optimum utilization of aromatic essences that are extracted from the plants. This is used to balance and harmonize the well being of the body in its entirety. These natural oils are extracted from different parts of the tree like the bark, flower, the stem or the root to enhance the well-being both psychologically and physically. The brain functions also get stimulated with the inhaling of these oils and when absorbed by the skin, they get mixed in the bloodstream and heal the whole body. Infact this therapy is treated as an alternative medicine which is gaining popularity worldwide. The usage varies over applications including relieving pain, enhancing mood and increasing cognitive function too. There are numerous oils used with unique properties. 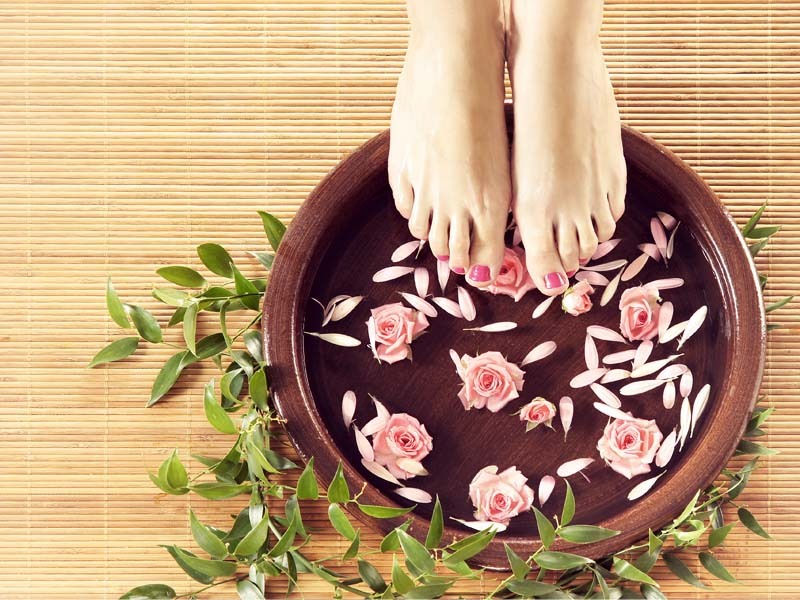 Your feet are most neglected when they deserve much more care and pampering. A foot spa is a once in a while treat that you can gift your tired soles and aromatherapy is one of the best options. These foot baths can be super fun and easy, relaxing and flexible too but are still quite under-appreciated. 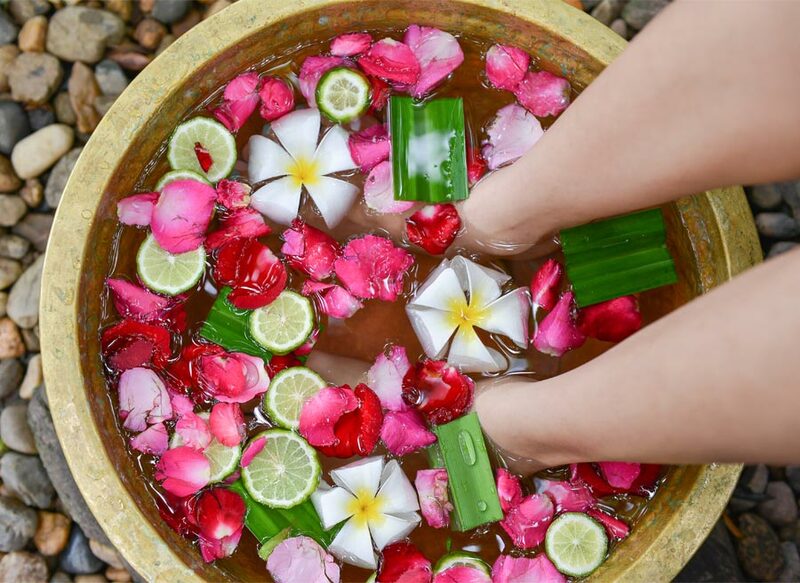 The convenience of an aroma foot spa is incomparable, especially if you are extremely busy. This foot soak is quick and fast and you don't need a tub too, to soak those tired and worn out feet. Do it while you are catching up on the latest soap, or even while making the last minute changes of your presentation. Even when you don't put any of the additives like the salts or the oil, the warm soak itself is very relaxing. Quick healing is enabled as the heat of the water quickens blood circulation and carries the essential nutrients to the feet. Healing is thus much faster. When you nourish your feet, the other body parts also reap benefits. The bloodstream absorbs the nutrients and reaches them there. So you get a get a comprehensive healing and thus feel rejuvenated and accomplished. The feet revive faster as the dead skin is exfoliated with increase in blood circulation. Fungal infections and Athletes Foot are taken care of as the Epson salt relieves the itchiness. Magnesium Sulphate in this salt lessens inflammation and calms your tired nerves and muscles of your feet. It is also good to stabilize your mood swings caused due to hormonal imbalances. You tend to get energised as the Dead Sea salts loosen the energy blocks. Overall it surely is a distressing way to relax as it reduces stress by lowering the blood pressure. The odour of your foot is controlled by the oils such as lavender and eucalyptus and tea tree acts as an anti-fungal agent to cure Athlete's Foot, in addition to lemongrass and grapefruit. Lemon Tea tree has a very pleasant scent too apart from the medicinal properties. The dry and chapped skins are addressed with Myrrh. You are invigorated when peppermint is added and cypress, sweet orange and Lavender lift your deflated spirits in this stressful world. The Thai spa offers you the Aroma Foot Spa with the best possible services by their trained therapists, who are directly hired from Thailand. There are four kinds to choose from ranging from detoxifying to softening, muscle relaxation and deodorant irritation too. The therapy spans from 45-60 minutes to render you the ultimate rejuvenating experience. How can sports massage help athletes to gain energy and relax? There are different kinds of massages that can be used for the wellness of the body. However, there is a very specific and special massage treatment known as a Sports Massage for the sportsman or for anyone who loves to work out to keep themselves fit and fine. This massage is achieving fast popularity as it works in a completely different direction than the other therapies. It helps to relax and relieve the muscles from pain or any damage by working deep within the muscles and also by readjusting the muscles and the connective tissues, thus helps to get rid of the toxins. Mostly this massage therapy is very effective for the muscles and the joints. This massage applies specific techniques and hydrotherapy protocols, flexibility protocols, etc. Sports Massage – A boon to the athletes! There are different kinds of sports massage and it is important to understand which technique is required for a particular athlete. The 3 important principles are Technique, Intent and Timing. It is very important for the therapist to understand what sort of sports massage is needed for a particular athlete. Therapists need years of training and knowledge to become trained sports masseuses. This massage does not include a lot of essential or aromatic oils, but only the necessary muscular stretching that keeps the joints flexible. This massage is a useful part of a balanced training routine. Sportspersons can opt for the therapy to improve their preparation for a certain event or simply to recuperate from any internal injury or pain while practicing. It has been noticed that the Sports Massage Therapy is very helpful in promoting speed, flexibility, helps to cope up with exhaustion and ultimately prepares the body and soul for best performance. Especially sports massage taken before or after an event helps in strengthening the muscle flexibility of the sportsperson. There are different kinds of Sports Massage like Pre-Event, Inter-Event, Post-Event and Maintenance. The main motive to avail this particular massage is to maintain and strengthen the body. This massage targets the muscle-tendon intersections. Studies and researches show that the massage decreases muscle distress and the level of flexibility increases. Apart from athletes, Sports massage is applicable for anyone who follows a regular exercise regimen and can be taken once every week for better result. No overview is separately needed to familiarize The Thai Spa. The spa has a lot of signature therapies which the expert therapists have mastered with rigorous training and practice. The Thai Spa justifies a special reference for being the only spa chain who is only known to hire experienced therapists from Thailand. It is the same for the Sports Massage as the trained therapists take around 90 minutes for one session of the massage. It helps in releasing muscle tension and averts injuries by making the joints more flexible, free of fatigue and ultimately helps you to be on your toes with a healthy body. We hardly get any time to take care of our skin and the best way to do so is by opting for a Rose, Honey and Milk Bath occasionally. The skin is a delicate organ and it needs to go through a lot of things every day those damage its health and make it rough. A relaxing Rose Honey and Milk bath can make you feel refreshed after a long and tiring day at the office. All you need to do is simply relax in a bath tub full of moisturizing milk, honey, rose petals, aroma shampoo, morning dew, scented oils and loofa. When you go for this in any of the renowned spas in your city, you will also have aromatic candles lit all around the room. This is a new service and is not offered by many spas. Milk makes your skin supple and soft. It contains fat and proteins and these benefits your skin immensely. Honey and milk also moisturize your skin and prevents skin dehydration. Lactic acid present in milk also makes your skin plump. Milk exfoliates your skin and makes it softer. Rashes, eczema and the likes can be cured with Rose Honey and Milk bath. Honey keeps your skin clean by also cleanses your skin pores. It is also antibacterial in nature and thus prevents allergies and other forms of skin irritation. Rose petals are also anti inflammatory in nature and protect your skin. Milk improves the general health of your skin and thus improves its appearance as well. Honey also gives your skin a natural glow and makes it bright and radiant. Milk also enhances the growth of new cells thereby replacing the old and damaged ones. The effect of Rose Honey and Milk bath is soothing and can even help to reduce stress at the end of the day. Candle massage is a unique and fresh concept in the Spa industry. These are massage candles that can be used in various ways. These candles are not only scented but they burn to produce clean, silky, smooth and slightly warm massage oil. They are used in moisturizing and hydrating the skin through a sensual massage. These candles are actually processed from soy and poured into candle containers. Soy wax has a very low melting point, so it is easier to use as the heat is in control and gives an energetic feel when used as massage oil. Candle massage is a very innovative way of using candles in a two in one way by releasing the aroma and the melted wax as the medium of massage. How Candle Message is done? Candle massage can only be done by using soy wax and not with any other wax available in the market. Basically soy butter is used in these candles instead of wax and most of the time it contains jojoba oil. The process is very simple as when the soy candle burns, the butter inside it melts that secretes the oil in the butter. Soy butter has a very low melting point, thus when the candle is lit, it starts to melt very quickly without being hot and releases the aroma and the soy butter becomes liquid which can easily be used for the massage. Soy butter is a neutral product so; different good quality essential oils like lavender, lemon, tea tree, rosemary, etc. and aromatic oils can be infused with it. The aroma oils and the essential oils are infused for both the moisturising purpose and for creating an invigorating fragrance. What benefits you can reap from Candle Message? Candles have been a part of prayer and fairy-tale since ancient times. Therapeutically candles can create a sense of ease and tranquillity which is good for both health and beauty. The candle used for a candle massage is a 3-in-one product as it is a candle with wonderful fragrance, a moisturizing lotion and oil. These products are natural and organic as they are made from pure essential oils. These candle therapy massages help to relax by releasing the stress and tension from the mind and body; they also help to make you feel a soothing sensation. Few essential oils used in these candles can also help to heal physical wounds, stiffness, pain, helps in better breathing and blood circulation. 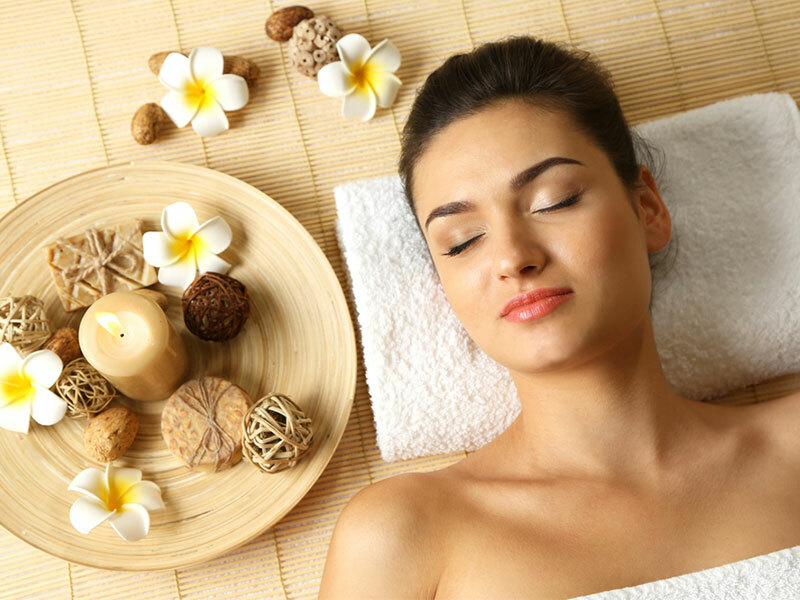 These therapies help in rejuvenating and refreshing the tired soul. The Thai Spa is a brand name in itself when it comes to any kind of spa or therapies. This spa has regained popularity over a very brief period of time due to their authenticity and signature therapies which offer holistic wellness to the clients. One of the very effective signature massages here is the Candle Massage which takes one to one and a half hours for a complete therapy session. Apart from the natural, herbal and organic products used here the massages are done by expert therapists and masseuses. The candles or other products used in the therapies are environmental friendly. This is an out of the book and new concept of head to toe indulgence massage for rejuvenation and wellness.